Home (All Topics) → Travel → USA → Ouray, Colorado: The "Switzerland of America"
One visit and you'll see why this Colorado town is known as the “Switzerland of America”. My husband and I never really had a favorite vacation destination — until we visited Ouray, Colorado. Some friends introduced us to this quaint Old West town in 1992, and since then we've returned every year or so. In fact, one year we even went twice! Ouray (pronounced “you-ray”) is one of those places you want to tell everyone about, but on the other hand keep it a secret so it doesn't change. It's nestled amid the San Juan Range of the Rocky Mountains and along U.S. Highway 550, part of one of North America's most spectacular scenic roadways–the 232-mile San Juan Skyway. Founded in 1876 as a gold- and silver-mining town and named after a Ute Indian chief, the entire town is listed on the National Register of Historic Places. To get a better sense of the town's mining legacy, the Ouray County Museum on Sixth Avenue is a good place to start your visit. 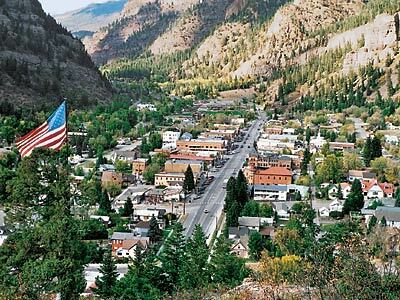 With only 800 or so year-round residents, Ouray is small and easy to get around. With its cozy shops, cafes and bed-and-breakfasts, it's a fun place to walk around and browse to your heart's content. But remember, you're at an elevation of 7,760 feet, so even a short walk can leave you breathless. Whenever we visit, Myles and I start our mornings at the Silver Nugget Cafe on the corner of Eighth Avenue and Main Street. I always order the breakfast burrito. This is no ordinary hold-in-your-hand burrito with a scrambled egg rolled up inside. No, sir, this is a huge tortilla shell stuffed with eggs, bacon, sausage and peppers, then smothered with meat sauce and your choice of red or green chile sauce. Above the Silver Nugget is the Columbus House Bed & Breakfast (1-970-325-4551). All guests receive a full breakfast at the Silver Nugget. What a deal! During another trip, we stayed at the Historic Western Hotel (1-888-624-8403). This classic Old West hotel, with 12 rooms and shared European-style baths, still looks much like it did back when it was first built in 1891. There's so much else to see and do around here that it's hard to know where to start. At the south end of town is Box Canon Falls, a breathtaking 285-foot-high cascade. When frozen in winter, it's the site of world-class ice-climbing competitions. A hike above the falls rewards you with a great aerial view. Don't miss a jeep tour of the surrounding mountains. There are several jeep tour and rental businesses along Main Street. If this is your first time here, I suggest you take a tour and let a professional do the driving; the trails follow paths forged by the area's original miners! If you decide to drive around yourself, keep in mind that most of the jeep trails require four-wheel drive. And the jeep rental operators are happy to provide information about the road conditions. Breathtaking scenery awaits everywhere you turn. One day, a sheepdog laid down in the road in front of our jeep so we wouldn't hit sheep that were crossing the road! 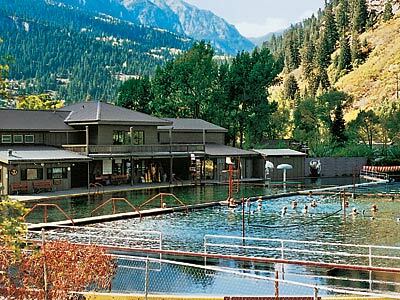 There's also horseback riding… entertainment at the historic Chipeta Emporium Theatre… tours of old mines… panning for gold… hot-air balloon rides… scenic hikes… and mineral baths at the Ouray Hot Springs Pools, a great way to relax after a busy day of sightseeing. And for lodging, there's everything from lodges to ranches to motels to B&Bs. No matter where you stay and what you do, I guarantee you'll want to return again and again! Ouray is on U.S. Highway 550, about 80 miles north of Durango in southwestern Colorado. For more detailed information about the town and activities mentioned in this story call the Ouray Chamber Resort Association at 1-800-228-1876. The Durango & Silverton Narrow-Gauge Railroad offers a spectacular 45-mile ride through the eye-popping Animas River Canyon. The historic Old West mining towns of Durango and Silverton (23 miles south of Ouray on Highway 550) are fun places to visit. To learn more, call the Durango Area Chamber Resort Association at 1-800-525-8855, or contact the Silverton Area Chamber of Commerce at 1-800-752-4494.